Metallica has received a full-fledged electronic makeover, and it’s actually awesome. Rather than sacrifice the feel of the original track, the trio have amplified Metallica’s single to new heights. 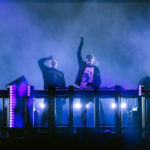 Reconstructing the gritty lead and beefing up the production entirety, The Glitch Mob’s new remix is the ultimate rock-electronic crossover. Quite fittingly, the track has been selected as the official anthem of the X Games Austin 2015, where Metallica, Nicki Minaj, & The GlitchMob will headline.